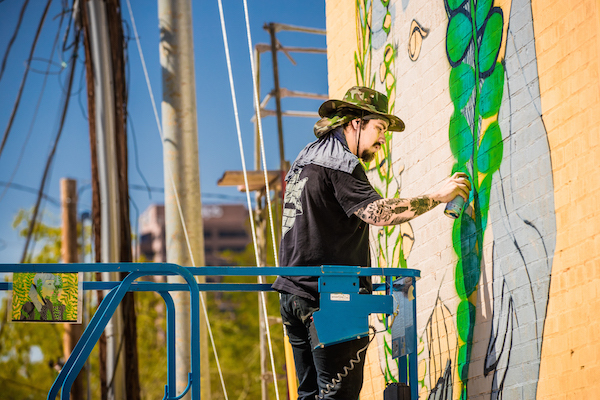 We recently commissioned Roosevelt Row street artist Tyson Krank to paint a new mural on the east-facing wall of the old Flowers building here at The Blocks of Roosevelt Row. With the help of his brother Denny, Tyson completed the intricate work in just under 24 hours. 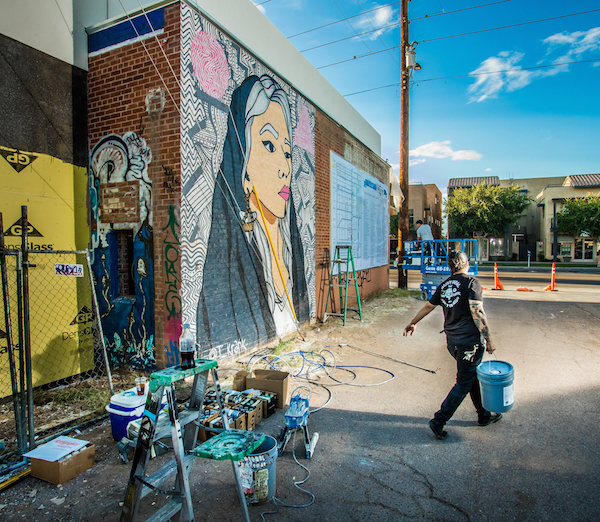 Here’s the full story on the mural and some background on Tyson’s work as a prominent Phoenix street artist. Tell us a bit more about the mural. What is the meaning behind the work? Does it have a title? It doesn’t have a title. I don’t really title any of my pieces because I consider it just to be visual art and I try not to define the meaning ahead of time; it’s usually revealed while I’m painting. But, I’ve always been drawn to portraits. This particular one is of Davina Griego, who I met soon after moving downtown. She’s just one of the most positive people that I know. 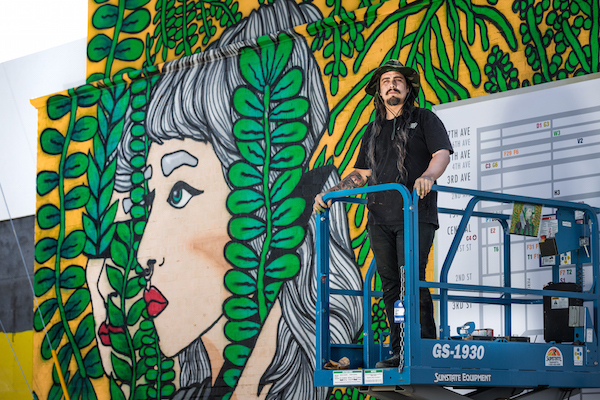 The mural itself incorporates plants and vines to kind of pay homage to the unity between nature and people, and consciousness in general – the idea of how we’re all kind of one organism. And the doubling up of the portrait signifies the different people that we have within ourselves. What inspired you to create this mural? I was originally just going to touch up the old mural that was in this spot, but with all of the change that’s going on in the neighborhood, I figured it would be a better idea to do something new – something that represented my current visual style as opposed to touching up a mural that had been there for two years. Your work is crazy detailed. What kind of gear or material went into the creation of the mural? How much paint did you use? After we scraped off any loose debris, we probably used about six gallons of primer for two really good coats. Then, I’d say it was close to 45 or 55 cans of Montana 94 spray paint. 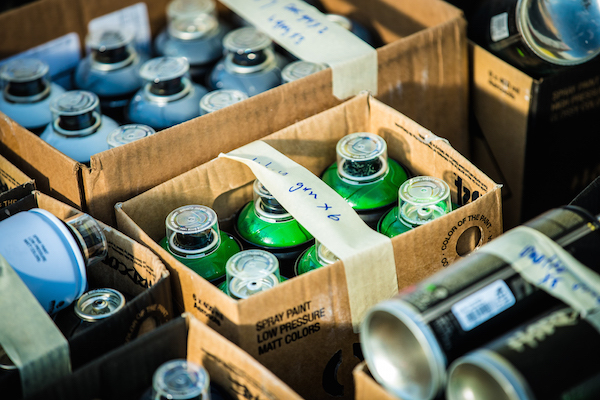 I get most of my materials from Spray Planet and Howard’s Ace Hardware in Phoenix, which is one of the best and only places in town for artists to get mural paint supplies at an affordable price. They don’t jack up the prices on Montana spray paint like most other stores do. Can you share with us what your creative process is like? Do you sketch out ideas on paper first? It depends on the wall and project. 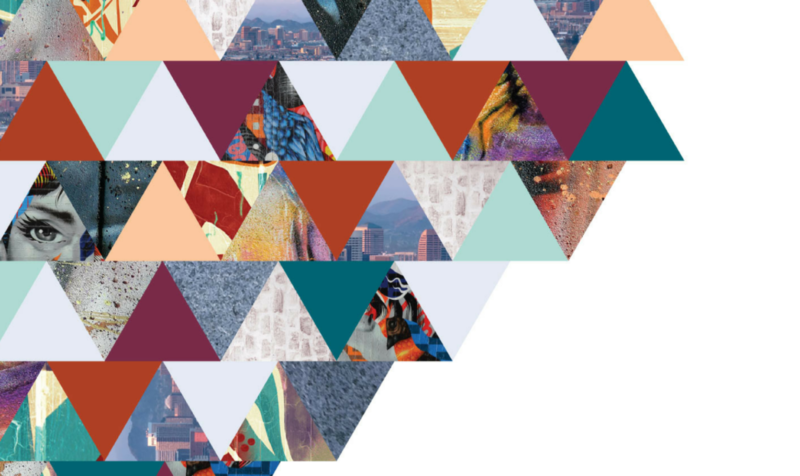 If it’s a pattern-based mural, I do a concept sketch on my computer because it allows me to play with the colors more easily. I play around with the color concept on Adobe Illustrator and then get color-matched paint based on what I designed in the program. If a wall is less than 18 feet, I’ll typically use an old 3M-image projector to project the sketch of the portrait onto the wall so that I can easily outline it. That sounds like an intricate process. How did you get it all done for this mural? I had help. My older brother, Denny Krank, has owned his own painting and mural company for 20 years and done some faux-finishing work in businesses and restaurants around the Valley. He was basically the foreman of this job. He got the walls ready to paint, scraped the loose debris and did some pressure washing then prepped the areas that were going to be painted. So, when I got there, I could just start painting. Without him and Davina, this mural couldn’t have happened. Let’s talk about your work in general. What inspires you most as an artist? I’m not as inspired by visual ideas as much as I am inspired by the people and work around me. It’s just a habit at this point to create something or be thinking about what I’m going to create next. Being around prolific people that are growing in their art and doing great things is just a reminder that I need to get out and create. I’m always doing something; sometimes it’s not even art-related. I think I just like to stay busy. But I try to turn most murals that I work on into a collaborative project with other people. 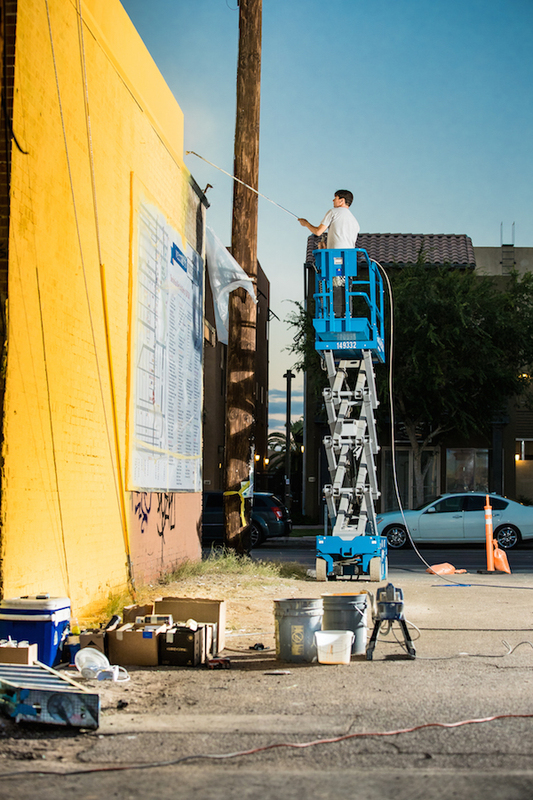 Speaking of, what are some of your favorite Roosevelt Row street artists? Andy Brown, who goes by sleisure, is one of the first street artists whose work I saw and was really taken aback by. He does great organic and flowing color concepts and is always down to just go out and paint. He’s a super positive dude and easy to work with – always has a smile on his face. There’s also JJ Horner – one of the owners of the Pyramid Country skateboard company. Everything he’s done mural-wise is amazing and next level. Karl Addison does portraits with really weird color concepts that are super cool. 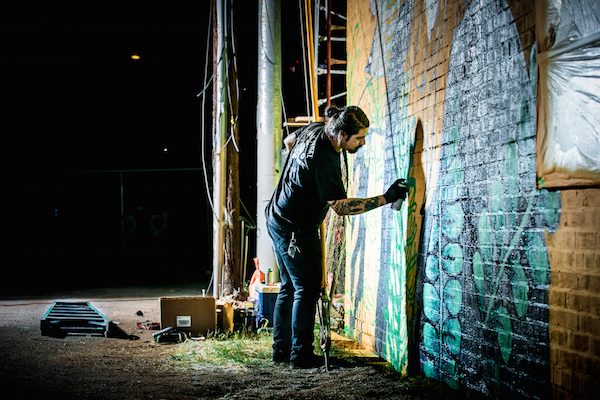 Josh Brizuela, aka Bask, has work that is so organic. He just walks up to a wall and starts painting. He doesn’t even use a projector, just makes it look like he’s drawing on a piece of paper. 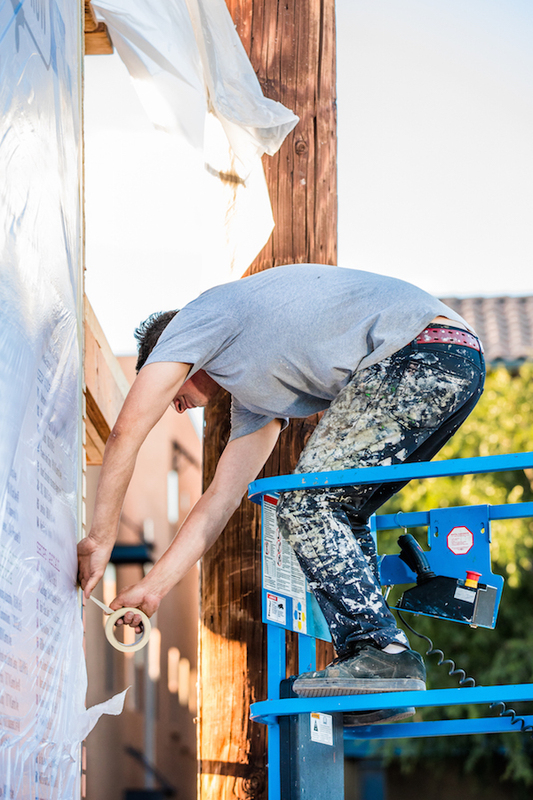 Finally, what is it about Roosevelt Row and downtown Phoenix that makes you want to display your art there? It’s a community. It’s convenient to paint here because everyone is on the same page with murals and artwork in general. Access to walls is fairly easy. You can just ring a doorbell or talk to the businesses and most of the time they’re happy to have some mural work if they don’t already. That’s where I got my first opportunity to paint a large-scale mural even though I’d never done anything like that before. My first show was at Jobot and I had 16 paintings and I sold the show out in less than three days. That made me realize I can do this and the community down here is going to support it. A huge thank you to Tyson and Denny for bringing this spectacular piece of art to life. If you’d like to see more of Tyson’s work, be sure to follow him on his Instagram @t_krank. Thank you, this mural was a treat to work on.